Acupuncture for Shoulder Pain – Musculoskeletal problems that are temporary or long-term, localized or spread-around the shoulder, are increasingly becoming common for people all around the world. In the US particularly, this warrants emergency help for millions. When people with complaints of shoulder pain visit our acupuncture clinic, they want treatment that can effectively reduce, if not altogether remove, their pain. 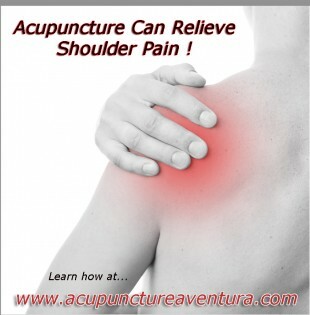 It is for this reason they are inclined to request acupuncture therapy for shoulder pain. Shoulder pain is said to be a stress-related problem. People who experience pain when they rest on their affected sides, or those who experience sharp spasms when stretching their arm or positioning it in an elevated angle, are diagnosed with shoulder pain. The pain has a gradual onset, there is swelling as well as weakness at and around the side and front of the respective shoulder. Well, the shoulder joint comprises the collarbone (clavicle), shoulder blade (scapula), and upper arm bone (humerus). Its stability depends on all the tendons, muscles, and ligaments. Medical issues like arthritis, fractures, instability and tendon inflammation or tear, infection and tumors give way to this trouble. The excessive and abnormal movements of the shoulder result in inflammation of the shoulder tissues and makes even daily activities become painful. At times, injuries from manual labor or sport activities or simply age degeneration can either partially or completely pull away the tendon from its attachment and cause the head of the arm bone to force itself out of the socket resulting in shoulder dislocations. Acupuncture at our clinic can help decrease shoulder pain. Once an assessment and reliable judgment of muscle strength, joint stability and the shoulder range of motion is carried out a viable treatment plan is put together to ensure that your shoulder will regain its strength and flexibility. Whether your pain or injury is due to rotator cuff tendinitis, biceps tendinitis, shoulder bursitis, arthritis, labral tear, shoulder impingement syndrome, shoulder instability, or is a frozen shoulder, acupuncture can help. Unlike the limitations and side effects of conventional treatment options such as anti-inflammatory drugs or physical therapy sessions, the insertion of pre-sterilized, fine acupuncture needles better improves blood flow to the shoulder, reduces inflammation around the joint, and facilitates the release of endorphins or natural pain killers in the body. This method of healing allows the body to adjust and heal naturally. Treatment is usually accompanied by tuina massage, Chinese cupping techniques, along with the patient’s personal exercise and stretching program to promote healing and muscle relaxation. Also, Chinese herbal remedies are used to complement therapy. So if you’re suffering with a shoulder injury please call us, we can help. Acupuncture is a powerful treatment modality that can bring you back to full strength. Our acupuncture clinic is located in Aventura Florida minutes from North Miami Beach, Hallandale Beach, Sunny Isles and Golden Beach. Call us today at 786-537-7022 to schedule your first session.